ATLANTA — The NFL approved a new owner for the Carolina Panthers, passed a rule to eject players who hit with their helmets, and took steps to spice up the kickoff. "We recognize with our visibility and the interest itself that it's taken a life of its own," Dallas Cowboys owner Jerry Jones said Thursday. "We ask the world, 'Don't turn your head. Look at us. Wait a minute. Look at the NFL. Look at everything we're doing.' And then when we have some issues we've got to work through, we realize we've asked you to look. "Let's do as good as we can do." At their annual spring meeting, league owners welcomed David Tepper to their ranks by signing off on his record $2.2 billion deal to purchase the Panthers from disgraced team founder Jerry Richardson, who abruptly decided to sell after the NFL began investigating alleged sexual and racial misconduct in the workplace. "What's the name of the team? Carolina Panthers. It's going to be the Carolina Panthers," Tepper said. "And that means this team has to have some kind of presence in the Carolinas and last time I saw, how many are there? That's right, there's two of them." But Tepper, a hedge fund owner who is worth a reported $11 billion, also reiterated several times that the largest city in the Carolinas is the "logical place for this team." "As far as a new stadium, you're asking me too much and the only thing I have a market on now is lack of knowledge," he said. "I'll learn a lot more in the future." Tepper's purchase was the first order of business at the luxury hotel in Atlanta's tony Buckhead neighbourhood. As a minority owner of the Pittsburgh Steelers, Tepper was already familiar to the league's owners and his approval was a mere formality. The vote was unanimous. Anthem protests are a much thornier issue. "We certainly want to make and will make a thought-out, deliberate decision," said Jones, who has made it clear he opposes kneeling during the anthem and was one of the few people to speak with reporters in the hotel lobby after the meeting broke up. "Whatever we do, let's put the focus on what the NFL's about and that's playing football." The owners began discussing the issue — which has reached all the way to the White House — and will talk more before wrapping up their meetings Wednesday. "I think there's certainly resolve and I can assure the issue is getting the very best of every owner and the very best look at all our constituencies with an eye first and foremost to our fans. That's No. 1," Jones said. "We know our fans want us to zero in on football, and they don't want to think about or think that we're thinking about anything other than football." 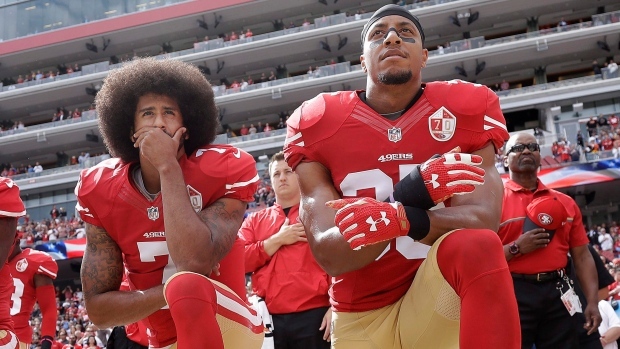 The NFL was reportedly considering whether to assess a 15-yard penalty against any player who takes a knee or conducts any other protest during the anthem. Another possible option would be to change up the pregame routine, keeping teams in their respective locker rooms until after the anthem has played. That is the protocol long followed by college football, preventing anthem protests from being carried out in its stadiums. The new kickoff rules are aimed at making the high-speed play a bit safer and perhaps more exciting. Players on the kickoff team can't get a running start, while eight of the return team's 11 players must start out in a 15-yard zone near midfield, forcing them to run down the field alongside the coverage players. That will make the play more like a punt and should improve safety. Wedge blocks — two blockers teaming up on the same player — will also be banned. In addition, any kick that hits the ground in the end zone will be an automatic touchback. The new rules will be re-evaluated in 2019 to determine their effectiveness, but the league doesn't want to eliminate kickoffs altogether. "It's part of the game," said Atlanta Falcons President and CEO Rich McKay, head of the league's competition committee. "If we can make plays more competitive and safer, we should do it." In another attempt to improve safety, any player who initiates contact with his helmet is subject to ejection after an in-game video review that will be decided in New York. Al Riveron, the league's head of officiating, said a foul can be called regardless of where on the body — not just the head or neck area — that one player hits another with his helmet. The rule is not position-specific, so offensive players will be subject to the same criteria as defensive players. "This is about eliminating unnecessary use of the helmet," Riveron said. If a player is ejected, Riveron and his staff in New York will use network camera angles to determine if the ejection is necessary. He promised that games will not become "an ejection fest" every week. "Immediately when I learn in New York that there's an ejection, I will ask the network to give me everything you've got," Riveron said. "I will take a look at it, I will rule on it and I will say yes, he's ejected, (or) no, leave him in the game.'"